To be honest, this soup was really just the result of a using-up-everything-that-is-to-be-found-in-the-fridge challenge. But it makes a very nice midweek supper and is incredibly versatile and will work with different products along the seasons’ course. So feel free to play around with the recipe! In this case, this is a real early summer soup. Star of the dish are the broad beans. Their season is rather short – I only ever see them on the market from late may to mid july. Their preparation is coming with some effort, but believe me: it is definitely worth it for the really taste like spring! I bought them in bulk of one or two kilograms, podded them all in one sitting (2 kg whole beans will leave you with ca. 500g podded beans), used some at once and froze the rest (with their lighter skin still on). They will keep in the freezer for about two month. So the other day, I made a spring risotto with the broad beans, green asparagus, goat’s cheese and lemon zest or used them in a buckwheat salad along with green beans, radishes and dill…there are many, many options. But coming back to this little soup: another reason I thought it made it worthwhile sharing is the almond-parsley pesto. For this pesto is one of my most used condiments. It is essentially made from leftovers and can be made in endless variations – sounds pretty good, eh? The base for this pesto are, of course, almonds. Or rather: the almond pulp you are left with after making almond milk. Soak the almonds over night in 1 litre of water and add a pinch of sea salt. The salt is optional, but it’ll help break down enzyme inhibitors that prevent the nuts from sprouting and can neutralize our own enzymes, therefore making raw nuts hard to digest. On the next day, discard the water and rinse the nuts well. Place in a blender together with about 1 litre of FRESH water. Blend well for about 2 minutes. Strain the ‘milk’ through a fine cheese cloth and that’s it! You’ ll be left with delicious almond milk (by the way, very much cheaper than store bought almond milk!) and almond pulp that is no less precious. 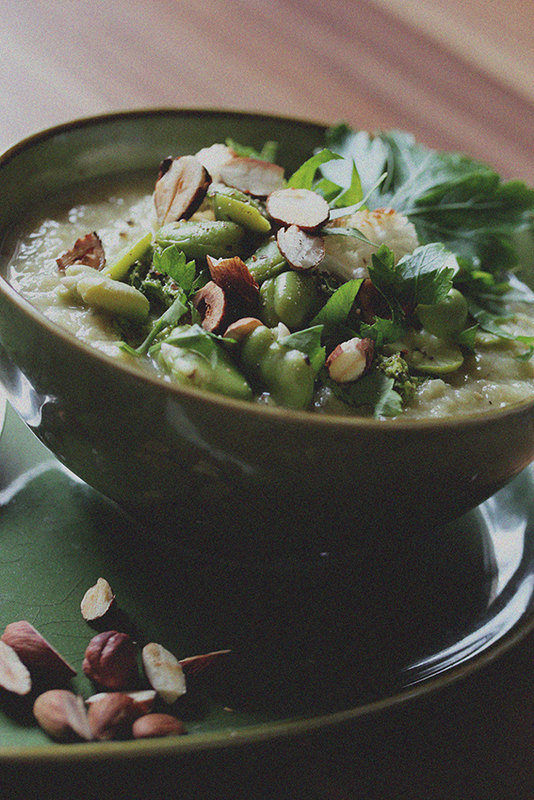 It is great in porridges of any kind or as a base for dips and – as you’ll see – pesto. Just one little warning: almond milk is turning rancid rather quickly, keep it in an airtight container in the fridge and use it within 2-3 days. But now to the actual recipe. I made the soup with cauliflower and leek (because that’s what I found in the fridge), but you could substitute the cauliflower with broccoli or use any other white vegetable such as celeriac, parsnips or jerusalem artichoke. The same applies to the pesto. Use the almond pulp as a base and add either parsley, basil, mint, wild garlic or all of them. When I am making mint-pea soup, I make it with coarsely puréed peas and mint as a ‘topping’ for the soup. This pesto is also the perfect companion for zucchini noodles. To make the pesto, blend all ingredients in a bowl with a hand-held blender. Add a little water or some extra oil if it’s too thick (I tend to leave it rather thick and add a little liquid depending on the way I want it to use later). The pesto will keep in the fridge for about a week, cover with oil for better preservation. To make the soup, simply cut the cauliflower in small florets – setting a few aside for the topping. Slice the leek and braise in a large pot in 1 tbsp coconut oil until soft. Add cauliflower florets and season with salt, pepper and nutmeg. Add the broth or plain water. Everything should be covered. Let simmer for about 30 min until the cauliflower has become soft. Purée the soup with a hand-held blender. In the meantime, cook the broad beans. They will only need a few minutes, so be careful, not to overcook them. Remove the outer skin (you could eat it, but I’m finding it too bitter) and set aside. Roast the almonds in a pan without oil. Fry the leftover cauliflower florets in the remaining coconut oil and season with a little salt and pepper. 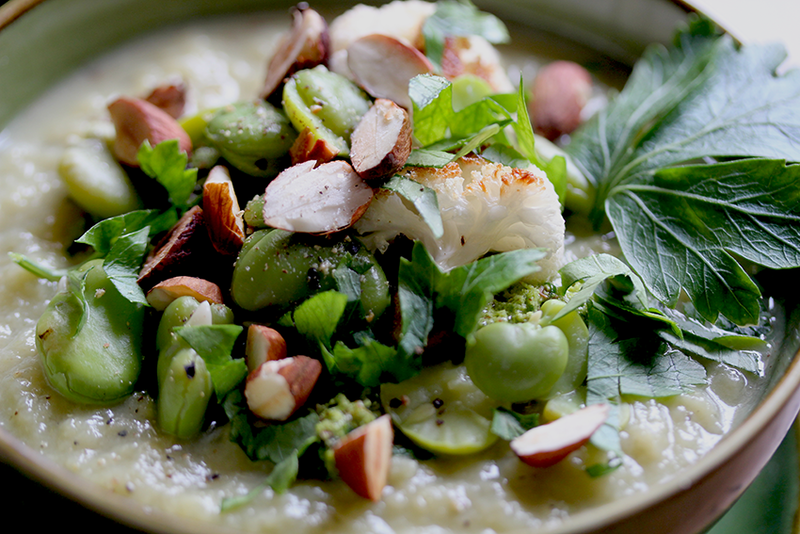 Serve the soup with a big dollop of the pesto and top with broad beans, cauliflower florets, almonds and parsley.